Beef Fajitas | Cooking Wine And Travel - The site where Foodies Unite! Beef Fajitas are a fun and fast dish to make. It is also a great way to use left-over steak from last nights dinner. 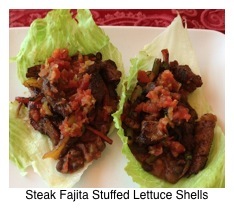 The traditional method is to serve the Fajitas over tortillas, but we prefer the healthier version by using iceberg lettuce shells instead of tortillas. In a food processor, mix garlic, cilantro, and habanera pepper until minced. In mixing bowl, mix meat with garlic/cilantro mix, taco seasoning, olive oil, salt & pepper. Mix thoroughly and transfer to a plastic storage bag, seal, and let stand for at least 1 hour. In pre-heated pan, add olive oil and heat until very hot. Add meat and stir occasionally until meat is browned on all sides (approximately 5 minutes). Then add peppers and onion and stir-fry until vegetables are lightly browned, yet still crisp. Pre-heat tortillas as follows: Pre-heat oven to 350 degrees. Spread a slightly damp paper towel or napkins on a baking sheet, and then cover with the tortillas. Add another layer of slightly damp paper towel or napkins. Bake for 5-10 minutes.